An American Colonial Period tall case clock with a label from Annapolis Maryland cabinetmakers John Shaw and Archibald Chisholm and housing an eight day time and strike movement by William Faris, clock maker and silversmith, was acquired by the Historic Annapolis Foundation, Inc., in 2004 when Schuettinger Conservation Services was hired to conduct a formal inspection of the case and movement and supply recommendations for their treatment. 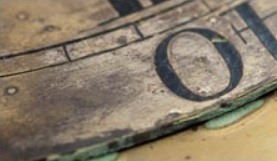 There were several phases to the treatment of this important clock. The first phase of the treatment was conducted and completed for an exhibition in 2006 to be held at the Maryland Historical Society entitled "A Gardener's Tale: The 18th Century World of Annapolis Silversmith William Faris" whereby a temporary completely reversible pediment and bracket base was designed using photographic images of period Annapolis, John Shaw, and Maryland decorative elements which were combined to represent the original apparence of the clock case and adhered to a wood and micro-laminate plywood substrate. 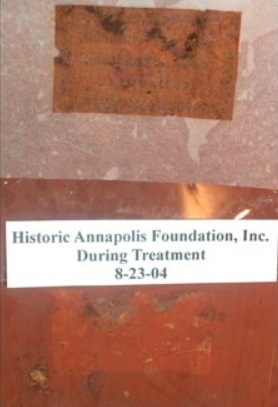 The second phase of the treatment and research continued in 2009 after the exhibition and temporary re-installation into the William Paca House in Annapolis, Maryland, and was completed in 2012. 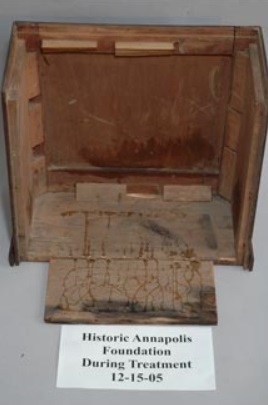 This second phase of treatment involved additional extensive historical research, various forms of scientific analysis, and the collaboration of other conservators to treat the original painted moon phase dial, the eight day time and strike clock movement, and the original cabinetmakers paper label. Schuettinger Conservation Services directed and supervised the team of conservators and historians as well as to design and fabricate a completely reversible pediment and bracket base system that represented the culmination of eight years of research and analysis of both the available physical and historical evidence. This bell form pediment with it curve linear blind fretwork decoration running from left to right along the tympanum of the bonnet maybe the only example of this form of decoration on the type of pediment from this period in existence. The images on this page tell the story of the treatment history of this clock and represent the condition of the clock movement and case before the treatment was initiated in 2004 as well as through the phases until final treatment in 2012. The image above shows accumulation of metals polish on the silvered chapter ring. The image above shows poor previous welding of strike hammer. The image above shows partial cleaning of original silvered chapter ring of the moon face during the treatment. 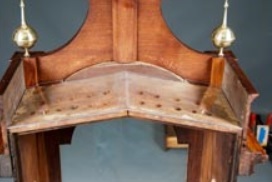 The image above shows an original fretwork fragment retained from the 1970's restoration campaign placed in its original position and pedestal. The first image below is a Philadelphia Chippendale carved mahogany tall-case clock, Ca. 1766 to 1775. The notable feature of this clock is the applied floral carving adorning the front of the bonnet. Other evidence on the clock helped to determine the bonnet's form. The size of the shaped molding above the bonnet door and the returns were a visual clue that the shape of the bonnet progressed inward from the point of the molding upward, precluding the existence of a swan's neck pediment which by definition has a curved molding that extends beyond the two plinth blocks. This is based on architectural and furniture designs of the period. 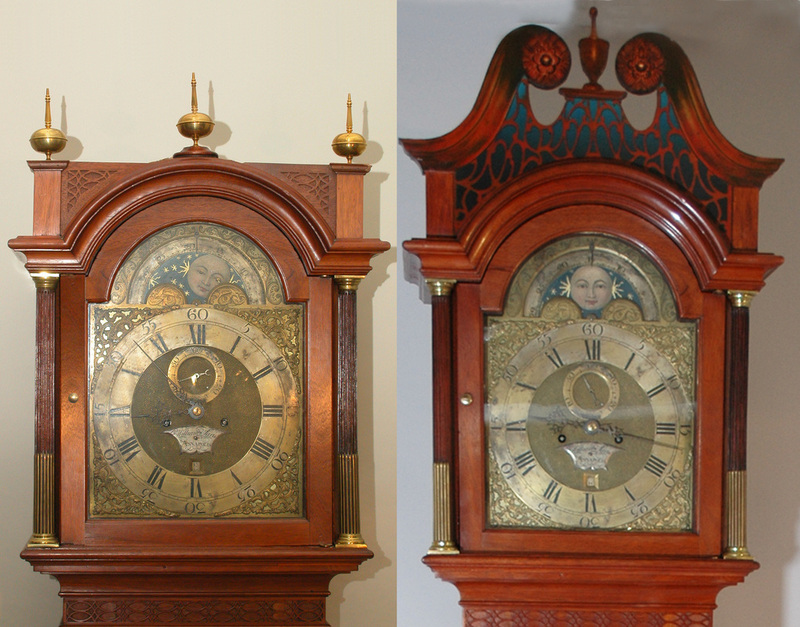 These images below show the progression that took place during the various treatment phases of this significant tall case clock. Below from Left to Right: These image show the condition of the clock movement and case during the treatment in 2004 and in 2009. The first image shows the partial disassembly of the case. The second image shows the removal of original paper label for the treatment by a paper conservator. 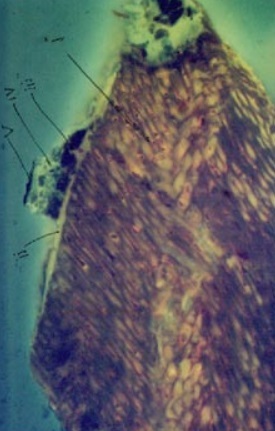 The third image is of a cross-sectional flourencents depicting 5 coating layers including the orginal natural resin spirit varnish. The fourth image shows the four layers of wallpaper and fabric on the bonnet covering the sounding holes. 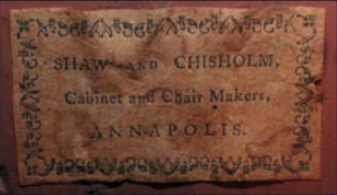 of John Shaw and Archibald Chisholm 1772 to 1776 attached to the back of the clock. Right: The representation of the temporary pediment and base during phase one of the treatment.